The successes below exemplify how we turn our customers into fans. When the City of Anderson, South Carolina needed a technology revamp, it turned to Sharp for its document, IT and professional A/V needs. When Greenwood County School District 52 in South Carolina was hit with Ransomware, the district turned to Sharp Business Systems for help. A four-panel video wall and interactive display system were installed in the exclusive VIP section to give BB&T Ballpark patrons and business partners more bang for their buck. A multi-campus institution with thousands of students adopts multifunction printers with a robust print tracking and chargeback system to keep costs down and control university-wide printing. A rebuilt IT infrastructure along with network monitoring and management, help desk and backup and disaster recovery have alleviated IT headaches and fortified HIPPA compliance at this physical therapy organization. As part of a broader move to paperless courtrooms, a state judicial court needed an audio/visual solution to allow courtroom viewing and presentation of electronic documents. Faculty now have an efficient and secure way to OCR files into Google Drive using a complete document capture solution. A completely overhauled IT infrastructure and continuous network monitoring provided by Sharp nearly eliminated downtime for this government contracting firm and ensured end-to-end business continuity. Here's how this company implemented an automated solution for processing inbound paperwork, increasing its processing speed by 66 percent and eliminating significant labor manual costs with a solution from Sharp Business Systems. When Herman & Kittle Properties needed to improve a document intensive application process, Sharp Business Systems Midwest recommended workflow software, which has tripled the property management company's processing speed. See how one of the world's oldest and most prestigious coffee and tea providers stays at the head of its industry using AQUOS BOARD® interactive displays for collaborative meetings and Multifunctional Printers (MFPs) to improve document management workflows. 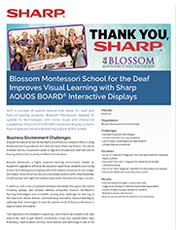 School addresses specific educational needs for deaf and hard-of-hearing students by updating its technologies with more visual and interactive capabilities using AQUOS BOARD® interactive displays. Major league baseball team receives a total Sharp technology refresh. University enhances learning using AQUOS BOARD Interactive Display Systems. Sharp supports a world-renowned zoo's philanthropic efforts and technology. School system saves $4,000 a month and reduces inefficiencies. City saves approximately $1 million per year by right-sizing its fleet of MFPs. Sharp provides an AQUOS BOARD Interactive Displays and a document capture solution to help keep the streets safer. School district saves money and secures new technology through the NJPA Program. Healthcare provider saves $600,000 a year by moving away from paper-based communication methods, right-sizing its printing equipment and incorporating digital signage and interactive display solutions.